Ordinarily, no one takes much notice when a new athlete enters into the spotlight. But when the Ethiopian athlete showed up for the second time in the Rome Olympics, in 1960, everyone was caught by surprise for one clear reason: the bare-footed Abebe Bikila emerged winner in the most grueling marathon race with a time of 2:15:16.2 which was a new world best by a less than a second while the dethroned record holder Emile Zatopek of Czechoslovakia, finished fifth. Even more so, unlike all his predecessors from 1908 to 1960 who were on the brink of collapse and fell several times before officials helped them cross the line, Abebe made it with style adding a couple of laps and some fitness exercise. For instance, Italy’s Dorado Pietre finished in 2:54:46.4 with the help of officials. The victory of Abebe in Rome is special to Ethiopia in at least one thing: as Reuter Dispatch sarcastically put it, once again Ethiopia emerged winner, bare-footed, on the sil of Rome. This was to remind the world that the Ethiopians have won over Italians during the resistance movement. The Rome Olympic Marathon race had also four special qualities: it was the first to start and end outside the stadium, the first to be won by a black African and the first where a bare-footed athlete won. In light of this Abebe’s victory was a history for the whole of Africa too since Africa’s first participation in the 1952 Helsinki Olympic Games where only Ghana and Nigeria were present, Abebe’s gold medal was the only reward that Africa earned. Abebe’s victory didn’t stop in Rome. Four years later, in the 1964 Tokyo Olympics. he emerged a comfortable winner by setting yet another new world record at 2:12:11.2. Abebe, as a result, became the first marathoner in the history of the Olympic Games to break his own record in the marathon. As a matter of fact, Abebe would have had a third victory in Mexico in 1968, but injury prevented him from completing the competition. One finds it difficult to tell the birth date of an individual in a country where birth certificates are little know. Abebe’s case is no exception. As we have witnessed, different sources give him different birth dates. Examples: the official source says that he was 28 when he won gold in Rome in 1960. According to this source, he was born in 1932. The English Merha Sport issue of January 1, 1989, took it back to 1928. It is generally agreed that he was born on the 5th of September 1933. He was born in North Shoa at a place called Jetto Bina Deneba near Debre Berhan from his father Bikila Demissie and mother Woodenesh Beneberu. 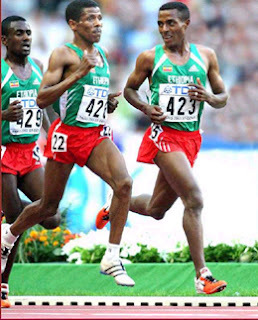 Abebe grew up with his brother Kinfu Bikila and sister Aschaletch Temtime. Like many in the country, he spent his early ages herding cattle and helping his parents. As he grew up he showed an interest in Guggs (traditional horse racing), Hokey Games, etc. His athletic talents were best seen upon his entry into the Imperial Body Guard in 1953. Oddly enough, it is confirmed, Abebe was dropped from enrolment in the army in 1948 due to his youngish age after five days of stay at the military camp. In 1957, he got married to Miss Yewubdar W/Giorogis and was to have six children, of whom two died. Abebe was paralysed from the waist down for the rest of his life in a car accident which occurred while driving back home from Sheno to Addis Ababa on the 14th of March 1968. He was flown to London to the Stockmandville Hospital. Interestingly enough, though confined to a wheelchair, his athletic prowess never came to an end. He completed in archery and won special prizes in the 25 km and 10 km stage race in Britain and Norway. He died on October 25, 1973, at the Imperial Body Guard Hospital and buried the next day at St. Joseph Church in the presence of the former Emperor Haile Selassie. But despite his untimely death, the great Abebe Bikila is survived by his four children: Dawit 28, Tsige 25, Yetnayet 22, and Teferia 20. In his eight years athletic career, he scored several spectacular victories. Following the footsteps of Abebe Bikila, many young athletic heroes, such as Miruth Yifter, Haile Gebreselassie, and Kenesa Bekele, Derartu Tulu, Gete Wami, and many others, made athletics a sports tradition of Ethiopia.